Recessed can lighting is a familiar method of lighting rooms. Rather than having fixtures protruding into the space, the light source is hidden in a recess in the ceiling, reducing glare. But, when the ceiling above is insulated, the can light fixture is a potential source of air leaks and thermal bridging. I recently got a press release from a company advertising a product to quickly and easily “convert” recessed can lights to a pendant light look. But, after a brief look, it turns out to be a particularly bad case of greenwash. The company advertises its product “reduces air leaks” around the recessed light, but there is no gasket or other means of sealing the cover plate, so it is unlikely to do much of anything in terms of reducing air leaks out of the box. More to the point, there is nothing that this kit does that addresses the original problem of an inefficient light fixture creating an insulation gap in the ceiling. In that way, this is like sticking a ‘Hybrid’ label on an SUV, or like putting a hybrid shell on top of a non-hybrid chassis and thinking that would make it a more efficient vehicle. It makes it look like the other, but underneath, none of the key issues have been addressed. Their greenwash also notes “energy efficient lighting,” though there is no mention of how this increases efficiency. 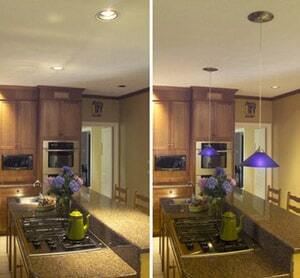 In fact, a recessed can fixture can be more efficient than a standard incandescent. Halogen lights are commonly available for recessed can lights, and are more efficient than standard incandescent bulbs. Rather than using the recommended 100 watt incandescent bulb the manufacturer suggests with the conversion kit pendant, a 60 watt halogen bulb would produce nearly the same light level and would last slightly longer than the conventional bulb. But halogen lights are generaly less attractive for direct view. The one pendant light fixture in my own house is one of the few places where I have not replaced an incandescent bulb with a compact fluorescent, and that is because it is directly visible. Greenwash aside, there are two kinds of recessed can lights: IC fixtures and Non-IC fixtures. Non-IC fixtures must have insulation kept from directly coming in contact to prevent overheating and the risk of fire. The IC fixture (the IC stands for “insulation contact”) is completely sealed and can have insulation placed right against it and on top of it. IC fixtures are also generally built tighter, with seals to reduce or prevent air leaks. In an insulated ceiling, an IC fixture should always be used, to allow the insulation against the fixture without any gaps that will contribute to heat loss. Non-IC recessed light fixtures are cheaper to produce, so naturally they are often found in homes where builders have cut corners to save money. If you are building new, or are renovating, be sure to use IC fixtures where appropriate. But if the ceiling above a recessed fixture is another floor, the non-IC fixtures are adequate, and IC fixtures are not necessary. Removing and replacing a non-IC fixture in a ceiling is a good step to take as part of an overall home improvement to tighten the house against air and energy leaks. If you like the look of pendants, this does offer an inexpensive (and reversible) method for getting the look without getting involved in a more extensive renovation. But don’t fool yourself into thinking that this is going to be a big energy savings step for you.